Since DMG is a native Mac OS disk image format opening DMG file is as easy as double clicking on it in Finder. When you open DMG file this way, disk image stored inside DMG file will be mounted, and then opened in a separate Finder window. If DMG contains installation of an application, then installation window of the app will open. If not, then you will see the disk image content. Even in case when disk image contains installation of the application you can still view contents of the mounted DMG file by clicking on its name in Finder Locations section or by selecting Go->Go to Folder… in Finder menu, typing /Volumes/ and clicking Go button. You can quickly mount DMG file by Control-Clicking on it and selecting Open With->DiskImageMounter.app. This will mount DMG file and its content will become available in Finder Locations and /Volumes folder. You can also mount DMG file using Disk Utility application available in Mac OS. Look for Disk Utility using Launcher and launch it. After that select File->Open Disk Image… in the main menu and choose DMG file you want to mount. After clicking Open you should see a screen like below where disk image details will be shown including used and free space, mount point, disk type and more. 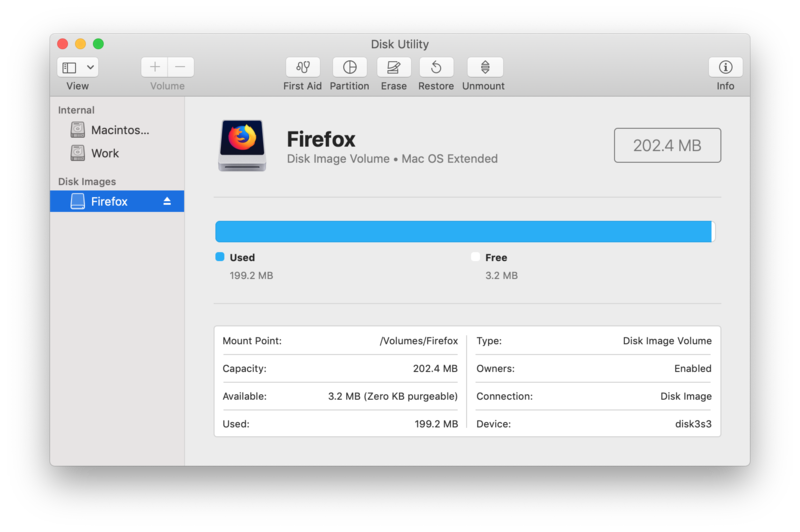 You can also access disk image mounted by Disk Utility in Finder Locations or /Volumes folder.